Aren’t we all looking for greater spirituality in our lives? We connect with G‑d by keeping His commandments, but we still need to prepare the groundwork so we are on the path reaching our higher selves. Here are some ways to do so. 1. Shabbat. Shabbat is compared to 1/60 of the Next World. 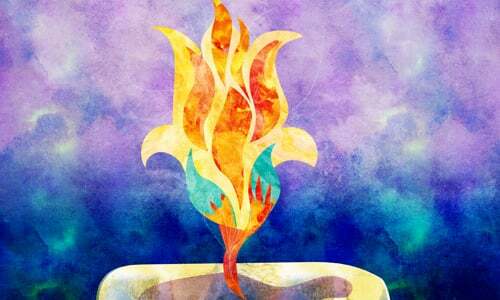 It’s the day we take off from our material existence to enjoy our connection with G‑d and celebrate with Him the weekly anniversary ofAren’t we all looking for greater spirituality? the creation of the world. It might not seem like that somehow when we eat and sleep more that day, but when our goal is spiritual, our physical activities become imbued with holiness and spirituality. Anyone who’s eaten challah or cholent left over from Shabbat will testify that it just doesn’t taste the same. That’s because the missing ingredient is Shabbat without which, the food is just food. 2. Nature. Shabbat helps us remember that G‑d is the Creator of the Universe. You remember that, too, by admiring His majestic mountains, His frothing seas, His towering trees and His glowing sunsets. Surrounding yourself with nature gives you perspective of how small your problems seem in the vast universe and how grand that universe is. Nevertheless, the Creator of the Universe has ultimate power to help you and takes interest in even the smallest of your problems. You have the ability to connect to Him. 3. Live a simple life. Only a couple of hundred years ago, life was simple for everyone. Not simple in the sense of easy, but simpler in the sense of uncomplicated due to the fact that technology and industry had not yet appeared on the scene, life was basic and slow-paced, and very few people could afford luxuries. Review your priorities and make sure your life is not cluttered by things that are not necessary and taking up too much time or space. Simplicity is the basis of a happy and holy life. 4. Find G‑d everywhere. G‑d is everywhere. But many times, we don’t call Him by name. We use euphemisms like nature, coincidence, opportunity, serendipity and miracle. But everything that happens—everything that surrounds you—is from G‑d. Start noticing the intricacy of nature and daily miracles that happen to you, and not only will you realize that you are the beneficiary of Divine Providence, but they will increase exponentially when you see them. Keep a diary where you note every incidence of Divine Providence—aka, luck, serendipity, coincidence and miracles you see. 4. Sleep. While stories abound of righteous and holy people who hardly ever slept, these stories refer to people who are engaged 24/7 in holiness. For those of us who have not yet reached that level, we need to recharge our batteries from the day-to-day wear and tear on body and soul. So getting sufficient sleep every night is important to keep us alert, calm and well-balanced. Before we retire, we say the Shema prayer, to remind us that G‑d is always with us, and to let go and allow G‑d to take over. Say the words clearly and they may even run through your mind as you sleep. That should help us recharge our spiritual batteries and remember what we’re living for. 6. Keep an even keel. Our lives are full of worries, tragedies, annoyances and delays, but if we remember that our lives are being orchestrated from Above for our own ultimate benefit, then we would stop trying to take control of every situation and go with the flow. Submitting ourselves to G‑d’s plan will keep us calmer and more spiritually inclined. 7. Be inspired. Reading inspiring stories of Divine intervention will inspire you to connect to G‑d more in your life. 8. Surround yourself with spiritual people. It’s hard to stoke your spiritual fire when you are surrounded with people who display vulgarity, materialism, self-absorption or negativity. While everyone is on their own individual spiritual journey, try and be with people who are higher than you so that you can more easily aspire to and reach greatness. 9. Talk to G‑d. Not only formally, in prayer, but all day. It’s OK to ask Him forYou can’t have a relationship without good communication the parking place or the raise or to lose five pounds before the wedding. He’s the right address for all these things. And also remember to say “thank you.” Ultimately, spirituality is a relationship with G‑d, and you can’t have a relationship without good communication. Seeing G‑d in your life is having Him talk to you. Speaking to G‑d is completing the dialogue. 10. Eschew honor and recognition. Pirkei Avot, the Ethics of Our Fathers, says that honor only pursues those who seek to escape it, and honor-seeking is one of the things that removes a person from this world. All the honor goes to G‑d. And what we are honored for are usually His gifts. Arrogance is antithetical to spirituality. Be grateful, but humble. Wishing you much success on your spiritual journey, which always starts with the first step! Rosally Saltsman is a freelance writer originally from Montreal living in Israel. Click here for free inspiring e-books by Rosally Saltsman and Robin Meyerson. This is very inspiring with strong and practical basics.